THURSDAY UPDATE: WBZ's David Brudnoy died this evening at Massachusetts General Hospital, less than 24 hours after saying a final farewell to his listeners in a recorded interview with Gary LaPierre. David was a friend, a colleague, a teacher, and one of the most interesting people ever to sit behind a microphone anywhere in the business. We'll have a full remembrance of him in Monday's NERW. *Howard Stern has, as his website reminds us daily, just over a year left on his contract with Viacom - but his prolonged departure for his new gig at Sirius Satellite Radio just seems to get more and more tortured, especially for listeners in central NEW YORK. Syracuse Stern affiliate WAQX (95.7 Manlius) was the flashpoint last week of a dispute that had been brewing ever since Judy Ellis, COO of WAQX's parent company, Citadel, complained during the NAB Radio Show in early October about Stern's show turning into a non-stop ad for Sirius. So it was that 95X - along with Citadel-owned Stern affiliates in York PA (WQXA-FM 105.7), Providence (WWKX 106.3 Woonsocket/WAKX 102.7 Narragansett Pier) and New Bedford (WKKB 100.3 Middletown RI) - last week began cutting off the Stern show at 10 each morning and getting on with their usual weekday programming. At least at press time Sunday, Citadel was sticking by its decision, even as Stern threatened legal action; NERW suspects this is a fight that will drag on for however long as Stern keeps doing his broadcast show, as stations that have been loyal Stern affiliates begin to consider how they move on to whatever comes next. Up in Saranac Lake, listeners to WNBZ (1240) had a hard time staying tuned last week, thanks to a windstorm that hit the North Country hard on the weekend of Nov. 27-28. 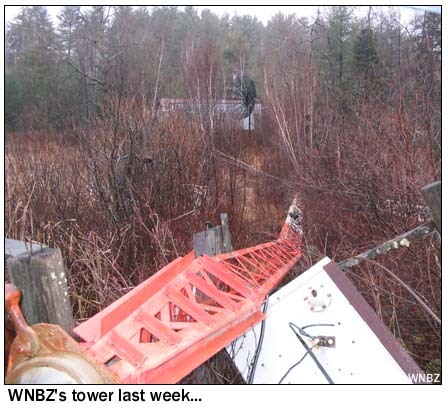 WNBZ's tower fell victim to the winds, as you can see above (there are more pictures to be seen on WNBZ's own website), leaving the station silent for the early part of last week. By later in the week, engineers had strung up a longwire antenna and restored the station to the air at low power; they're now trying to get a replacement tower erected before the really nasty weather kicks in up there. We hear that WRWD (1370 Ellenville) is indeed now simulcasting country WRWD-FM (107.3 Highland) from the Poughkeepsie market, for whatever that's worth. And out on Long Island, our best wishes go out to Paul Sidney, the driving force behind the one-of-a-kind sound of WLNG (92.1 Sag Harbor). Paul's had to scale his usual busy on-air schedule to zero for the moment as he struggles with some health issues. He's receiving cards and notes forwarded to him from WLNG, 23 Redwood Causeway, PO Box 2300, Sag Harbor NY 11963. *The other half of the WNYQ upgrade we alluded to earlier is in western MASSACHUSETTS, where Vox won the FCC's permission last week to move WBEC-FM (105.5 Pittsfield) some 30 miles east to Easthampton, which will land it squarely in the Springfield market on the other side of the Berkshires. The buzz in the Pittsfield market suggests that the "Live 105.5" top 40 format and the WBEC-FM calls won't disappear when the move takes place, likely landing at one of Vox's other FMs in the market, either WUPE (95.9 Pittsfield) or WMNB (100.1 North Adams). The first of December wasn't covered in snow, as it happened, but at the other end of the turnpike from Stockbridge to Boston, the day did bring a format change of sorts at troubled WBIX (1060 Natick). Former station owner Alex Langer reassumed control of the station, under the supervision of bankruptcy receiver David Vicinanzo, and that meant the end of the business-talk format that Brad Bleidt had been programming there. For the moment, Langer is programming talk from his National Radio Network, largely the same material being heard on WPYT (660 Wilkinsburg-Pittsburgh) and WVFC (1530 McConnellsville) in Pennsylvania; the hope, it would seem, is to restore some financial stability to 1060 so it can eventually be sold and at least some of Bleidt's debts (in no small part to Langer, who held the note on the station) repaid. As for WBIX's staff, they're largely out of work, which is a shame - there's no reason to suspect that any of them knew anything about Bleidt's financial misdeeds. We're pleased to report that WBZ talk host Paul Sullivan is not only out of the hospital but even back at work for some light duty (at the Lowell Sun) after undergoing brain surgery, but that's tempered by the news that BZ's David Brudnoy checked himself in to the hospital on Friday to undergo some tests to see why he's been unable to shake a cold. As always, our best wishes to both Paul and David for speedy recoveries! *In southern VERMONT, the Brattleboro Reformer reports that WOOL-LP (100.1 Bellows Falls) is struggling to get on the air before the winter weather sets in. 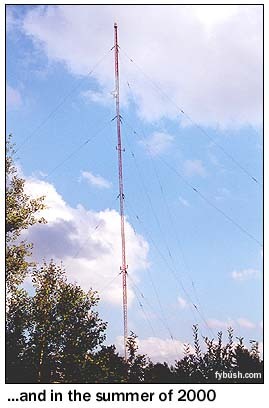 The "Great Falls Community Broadcasting Company" had to relocate its studios to another building after realizing that the original offices on Canal Street were right below a printing press - and the volunteers still don't know if they'll be able to get their antenna mounted on Mount Kilburn while conditions still permit. If they can't, they plan to sign on with a webcast and then add the broadcast signal in the spring. *Call it NEW JERSEY, or call it PENNSYLVANIA - in either case, the new 107.9 signal that's licensed to Pennsauken NJ and serves Philadelphia signed on for real last week. Radio One has already flipped the callsign again, from the interim WPPZ (which replaced the old WSNJ-FM calls from its days down in Bridgeton on 107.7) to WRNB. Those calls come from Radio One's Dayton, Ohio station on 92.1 (which reverts to its old calls of WROU-FM), and they signify the station's new adult R&B format. The rumor mill suggests, rather strongly, that the new WRNB will step up its challenge to Clear Channel's market-dominating WDAS-FM (105.3 Philadelphia) by making a play for the syndicated Tom Joyner morning show, which airs on WDAS but is now owned by Radio One. *CANADA? It's still up there - or at least we can still hear some of its radio stations - but it was a quiet week indeed on the broadcast scene, with just a few all-Christmas format flips (CFFX 960 Kingston and CJUL 1220 Cornwall) to report. It's getting a little late for trans-Pacific delivery in time for the holidays, but you can still have your calendar in plenty of time if you order now. We're shipping them out daily, and we'd be delighted to set one (or two, or three, or 30) aside for you.